“How do you know it’s true,have you ever seen an elephant? asked Obby. “Then how do you know that we aren’t related?” Cyril asked. “Because an elephant is huge and has thick skin and you are small and furry,” said Obby. “I may be small but I have thick skin,” Cyril replied, “ My sister tells me I’m thick skinned all the time,” Cyril said proudly. “Where are we going to find an elephant in Hermanus,” Cyril asked Obby. Of course Gugu pretended she wasn’t pleased to see them. “Hello Gugu, I hope we aren’t disturbing you, but we wanted to ask you a question because you’re the cleverest person we know.” Obby winked at Cyril. “What do you want,I haven’t got all day?” she said. “We want to know where we can find elephants?” said Obby. “It’s near Port Elizabeth,” said Gugu. “Can we walk there?”asked Cyril. “Hello Elphick.” Obby greeted his friend; a big Southern Right whale. “Do you mind if Cyril comes too?asked Obby. “Not a problem, but I thought he doesn’t like water,” said Elphick. “Are you sure Cyril doesn’t mind being thrown around,” asked Elphick. “Throwing him around?” asked Elphick. “Whose going to port Elizabeth,”asked Elphick. “Why do you want to go there? asked Elphick, who was now curious. “Don’t all dassies look similar? ” he asked. Elphick shook his head, he couldn’t believe what he was hearing. 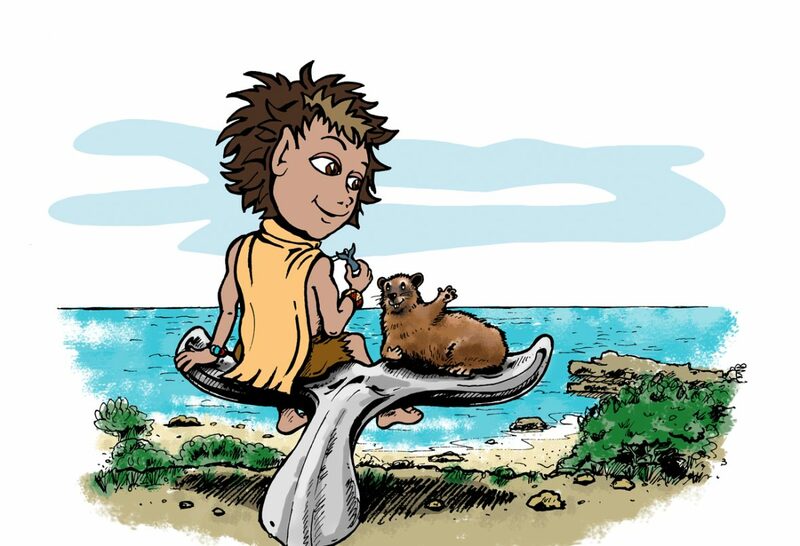 Gugu watched as they waved her goodbye from the whale’s tail…” I will send you a postcard,” shouted Obby. “With a picture of an elephant,” Gugu shouted back.